Onset of pseudomembranous colitis symptoms may occur during or after antibacterial treatment [see Warnings and Precautions ( 5.2)]. High urine concentrations of ampicillin may result in false-positive reactions when testing for the presence of glucose in urine using CLINITEST ®, Benedict’s Solution, or Fehling’s Solution. Since this effect may also occur with amoxicillin, it is recommended that glucose tests based on enzymatic glucose oxidase reactions (such as CLINISTIX ®) be used. In case of overdosage, discontinue medication, treat symptomatically, and institute supportive measures as required. A prospective study of 51 pediatric patients at a poison-control center suggested that overdosages of less than 250 mg/kg of amoxicillin are not associated with significant clinical symptoms. Interstitial nephritis resulting in oliguric renal failure has been reported in a small number of patients after overdosage with amoxicillin 1. The amoxicillin molecular formula is C 16H 19N 3O 5S•3H 2O, and the molecular weight is 419.45. Mean amoxicillin pharmacokinetic parameters from an open, two-part, single-dose crossover bioequivalence study in 27 adults comparing 875 mg of amoxicillin with 875 mg of AUGMENTIN ® (amoxicillin/clavulanate potassium) showed that the 875-mg tablet of amoxicillin produces an AUC 0-∞ of 35.4 ± 8.1 mcg∙hr/mL and a C max of 13.8 ± 4.1 mcg/mL. Dosing was at the start of a light meal following an overnight fast. Amoxicillin has been shown to be active against most isolates of the bacteria listed below, both in vitro and in clinical infections as described in the INDICATIONS AND USAGE section ( 1). Dilution Techniques: Quantitative methods are used to determine antimicrobial minimum inhibitory concentrations (MICs). These MICs provide estimates of the susceptibility of bacteria to antimicrobial compounds. The MICs should be determined using a standardized procedure. Standardized procedures are based on dilution methods (broth or agar) 2,3 or equivalent with standardized inoculum concentrations and standardized concentrations of ampicillin powder. The MIC values should be interpreted according to the criteria in Table 4. Diffusion Techniques: Quantitative methods that require measurement of zone diameters also provide reproducible estimates of the susceptibility of bacteria to antimicrobial compounds. One such standardized procedure 3 requires the use of standardized inoculum concentrations. This procedure uses paper disks impregnated with 10 mcg ampicillin to test the susceptibility of bacteria to ampicillin. Interpretation involves correlation of the diameter obtained in the disk test with the MIC for amoxicillin. Reports from the laboratory providing results of the standard single-disk susceptibility test with a 10 mcg ampicillin disk should be interpreted according to the criteria listed in Table 4. Susceptibility techniques require use of laboratory control microorganisms to control the technical aspects of the laboratory standardized procedures. 2,3,4 Standard ampicillin powder should provide the MIC values described below. For the diffusion technique using the 10-mcg ampicillin disk, the criteria are provided in Table 5.
a This analysis was based on evaluable patients with confirmed duodenal ulcer (active or within 1 year) and H. pylori infection at baseline defined as at least 2 of 3 positive endoscopic tests from CLOtest ®, histology, and/or culture. Patients were included in the analysis if they completed the study. Additionally, if patients dropped out of the study due to an adverse event related to the study drug, they were included in the analysis as failures of therapy. Capsules: Each capsule of amoxicillin, with royal blue opaque cap and pink opaque body, contains 250 mg or 500 mg amoxicillin as the trihydrate. The cap and body of the 250-mg capsule are imprinted with the product name AMOXIL and 250; the cap and body of the 500 mg capsule are imprinted with AMOXIL and 500. Tablets: Each tablet contains 500 mg or 875 mg amoxicillin as the trihydrate. Each film-coated, capsule-shaped, pink tablet is debossed with AMOXIL centered over 500 or 875, respectively. The 875-mg tablet is scored on the reverse side. Powder for Oral Suspension: Each 5 mL of reconstituted strawberry-flavored suspension contains 125 mg amoxicillin as the trihydrate. 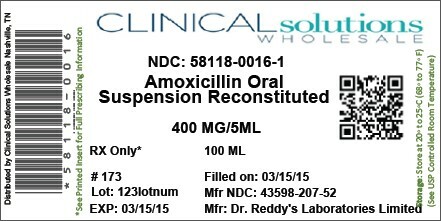 Each 5 mL of reconstituted bubble-gum-flavored suspension contains 200 mg, 250 mg or 400 mg amoxicillin as the trihydrate. contain amoxicillin trihydrate equivalent to 200 mg amoxicillin. Net contents: Equivalent to 2.0 grams amoxicillin.